Raspberries, blueberries and a little cream cheese make up the red, white and blue color scheme for this dessert, all sitting on a cookie like crust. My mom always requested this for any summer backyard barbecue because it was one of her favorites. I haven't made it in a while but this year I decided to dust off the old recipe and make for this weekend's pre-holiday cookout! Heat oven to 325 degrees F. Blend together the flour and brown sugar and then using either a pastry blender or fork, cut into the butter until the mixture resembles that of coarse crumbs. 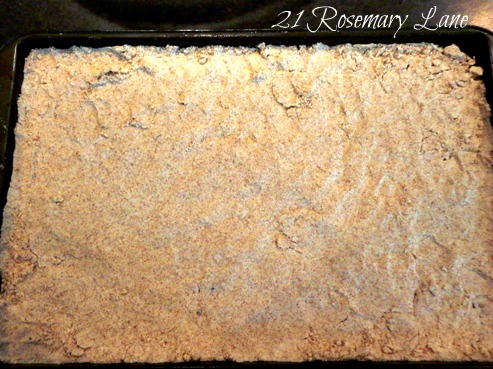 Spread flour mixture out onto a 15 X 10 X 1 inch baking sheet and press until the surface of the pan is covered. Bake in preheated oven for 10-15 minutes. Remove from oven and let cool. 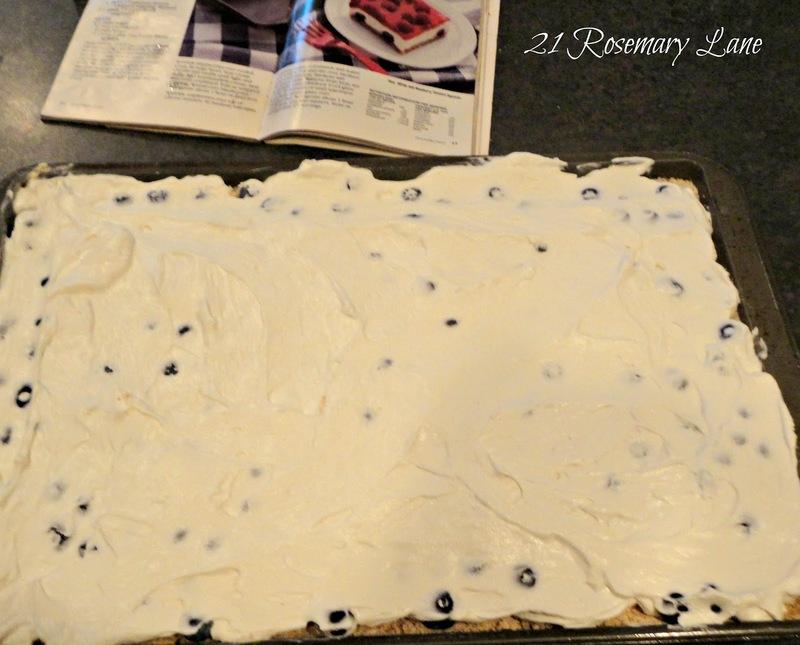 Sprinkle blueberries on cooled crust. In a large bowl, beat together the softened cream cheese and vanilla until fluffy. Add the marshmallow creme and beat again. Fold in the defrosted whipped cream, blend by hand, and then spread over the blueberries. Refrigerate for one hour. In the meantime, in a medium sized pot, add the sugar, cornstarch and water and heat. Cook until mixture thickens and becomes more clear than opaque. Add the raspberry flavored gelatin and mix. Set aside and let cool for about 20-30 minutes. 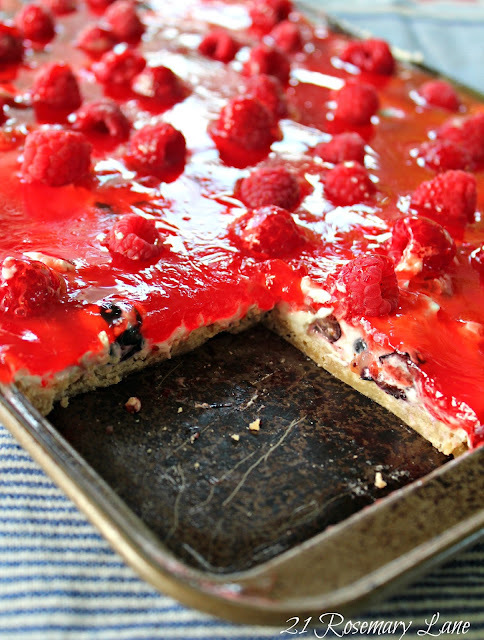 Remove tray from the refrigerator and place the raspberries on top of the now cold cream cheese mixture. Spoon the cooled gelatin mixture over top of the raspberries and then refrigerate again for one hour. Cut into desired square sizes and serve. Yum! Looks delicious! And pretty too! 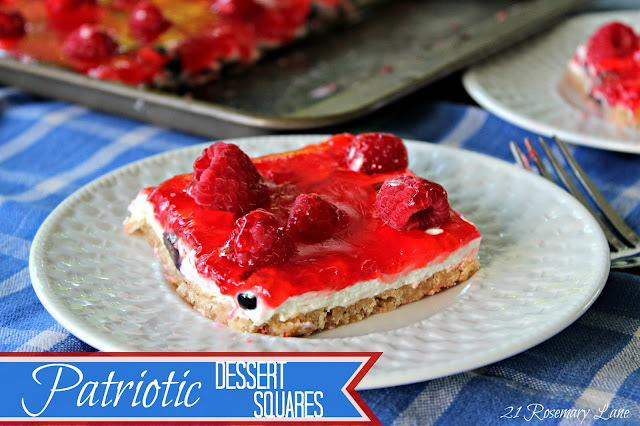 Unfortunately, I went to the store yesterday and got all my fixin's for Memorial Day and I'm having Strawberry Shortcake but I know what I'm making for the 4th of July now! Thanks for sharing! It does look delicious and I'm sure it is! Happy Memorial Day to you and your family. How pretty and perfect for this holiday weekend! Thank you for your lovely comment on my screen porch. And if it wasn't for blogging that porch would remain drab until sometime mid-to-late June! I wish I had some of this right now! Looks and sounds delish. I will definitely be making it. Not sure how you do it, you you come up with the yummiest dishes and to top it off your photography skills are amazing Barbara! Have a wonderful holiday weekend! These look fabulous!And they couldn't be more festive. I sure hope you'll link this post to Seasonal Sundays. Barbara this looks absolutely yummy! 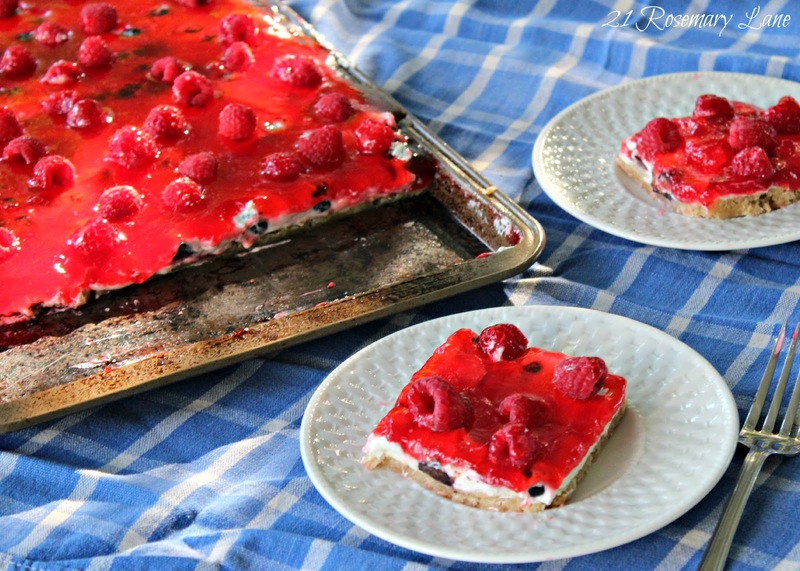 Really a great summer dessert. Thanks so much for sharing with the copy cat party. Just finished making this........2 and a half hours after i started! 3 recipes in one. $20 to make. Won't make again no matter how good I'm sure it's going to be. Aggravating. Wow Ms. 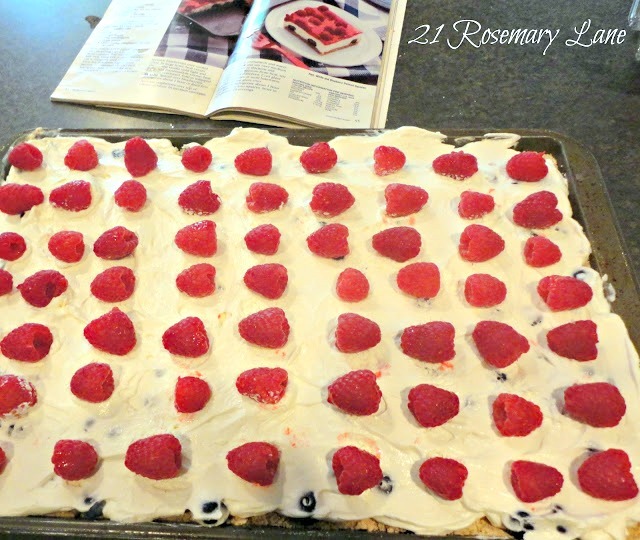 Anonymous...so sorry this recipe did not work for you because it really is a wonderful treat. Honestly I have been making it for over 20 years and have never had a problem because it is such a simple recipe.